Taking a classic to the next level. 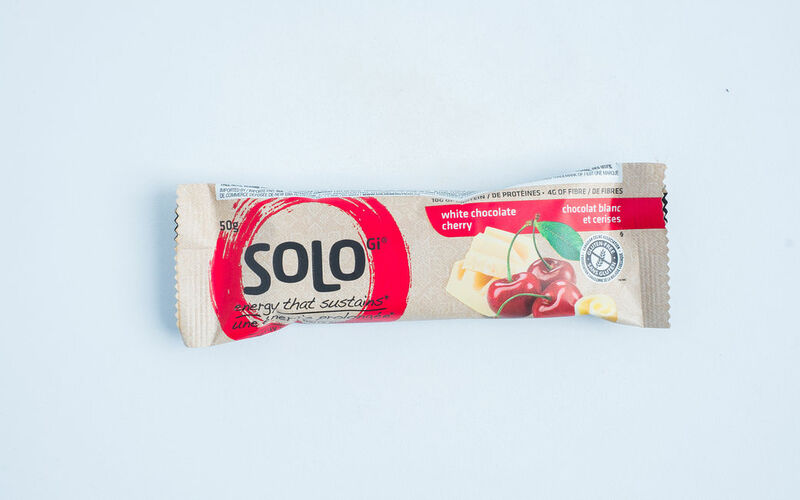 SoLo White Chocolate Cherry energy bars are dipped and drizzled in silky white chocolate, with handfuls of succulent and tart cherry pieces adding a fresh, fruity finish. Solo Gi® Protein Blend [Whey Protein Isolate, Soy Protein Isolate, Whey Protein Concentrate, Soy Crisps (Soy Protein Isolate, Rice Flour, Salt)], Brown Rice Syrup, Coating (Sugar, Cocoa Butter, Whole Milk Powder, Soy Lecithin, Natural Flavours), Soynut Butter (Soybeans, Soybean Oil, Maltodextrin, Sugar, Palm Oil, Salt), Beet Syrup, Fruit Puree (White Grape Juice Concentrate, Prunes, Dates, Fructose Syrup), Dried Cherries (Cherries, Apple Juice Concentrate, Sunflower Oil), Chicory Fibre, Lecithin, Organic White Chocolate (Organic Cane Sugar, Organic Cocoa Butter, Organic Milk Powder, Soy Lecithin, Organic Vanilla Extract, Organic Ground Vanilla), Sunflower Oil, Soynuts, Dried Bing Cherries (Bing Cherries, Rice Flour), Natural Flavours, Malic Acid, Soy Lecithin.